John Reyhons fell in love with the Fed-Ex business model once he started to study it. “Home delivery and that type of business is growing so much. All of the big companies, like Amazon, are shipping now. We love the business model and where it’s headed,” he said. So, when John and his wife decided to invest in the purchase of 14 Fed-Ex routes and 16 trucks in the Durham, North Carolina, area, they knew they had to find some financing help. After a referral to Stearns Bank’s Brett Hucka, a conversation was started. The Reyhons family had to move from Montana to Durham to start the business, which made things a little more complicated. “When I started talking with Brett, I knew he was the guy I wanted to work with,” John said. "It was challenging, but Stearns Bank helped guide us through the process and how SBA loans work." Brett helped guide the Reyhons through the SBA loan process from start to finish. With the purchase of so many routes and trucks, the timeline took a lot of twists and turns, but their faith in Stearns Bank never wavered. 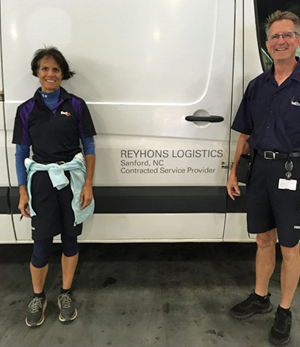 Reyhons Logistics Inc. started its routes on June 1, 2018. “It was challenging, but Brett helped guide us through the process and how SBA loans work,” John said. “He was instrumental in connecting me with people in the business and helped me create relationships with others who run logistics companies.